A re-telling of what Yuria was doing in the Hokuto no Ken story. At an airport, Yuria is with her brother, Ryuuga, and their foster father, Dama. The three are about to board a plane, when Yuria (who is mute) suddenly runs off. Ryuuga and Dama go after her and see her becoming fearful when their plane starts to take off. 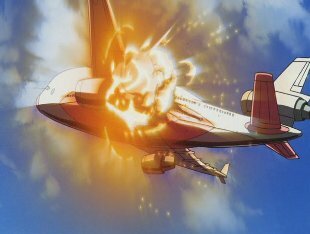 Seconds later, one of the plane's jets explodes, and the entire aircraft crashes. Whilst everyone else there is in shock, Dama and Ryuuga aren't as Yuria has apparently been able to sense things like this before. Ryuuga says that she has had another message from heaven, whilst Dama tries to comfort her. He says that it isn't her fault this happened and that she mustn't fear her gift. She has it for a reason and one day she will know why. Until then, he will protect her. Some time later, at the Hokuto Shinken dojo, Ryuken watches as his four adoptive sons spar. Dama then arrives with Yuria. Ryuken says that he has been waiting for her arrival, but she says nothing. He then asks her what the name of the puppy she has with her is, but again she says nothing. He asks Dama if she is mute, but he says she isn't -she has just closed her heart off to others. Her parents died when she was very young. Tobi, Yuria's dog, suddenly runs forward and is almost kicked by Jagi, but Kenshiro saves him. As Yuria takes Tobi off him, she smiles. Dama finds this incredible, but Ryuken tells him not to worry. She will one day open her heart. Years later, Yuria has grown up and can now talk. And Tobi is still around too. She says that Tobi seems to be full of life today, just as Ryuken appears and says Tobi is quite an amazing dog as he hasn't appeared to have aged, whilst he has. And as he has become so old, the time for him to choose the successor to the Hokuto Shinken style has come. He says that after he chooses, each of his four sons will take different paths. He asks Yuria was she intends to do after he has chosen, and she says she will go with Kenshiro. 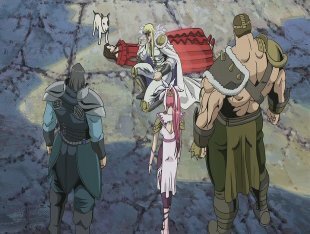 Ryuken warns her that the path Kenshiro will take will be one of suffering, but she says that the heavens told her to take that path. 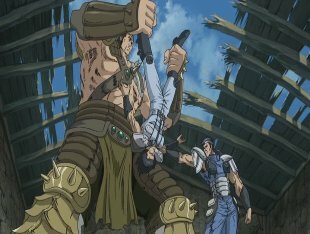 Ryuken chooses Kenshiro to be the successor, something Jagi is enraged to hear. 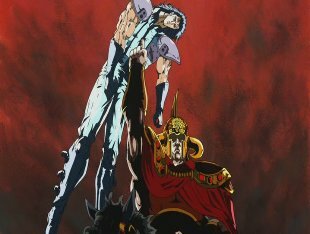 After trying to discuss it with Raoh and Toki and getting nowhere, he goes off to confront Kenshiro by himself and demands that he goes back to Ryuken and tell him that he does not want to be the successor. 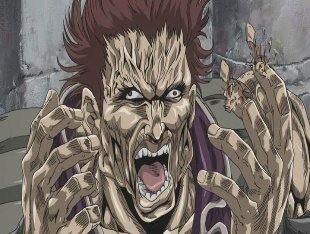 Kenshiro uses a technique which badly disfigures Jagi's face, but he does not kill him. Jagi gets up and tells him that was the only chance he had in killing him. He runs away, saying that he will have his revenge one day by taking Kenshiro's life. 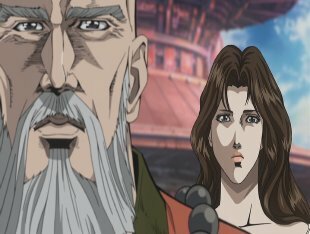 Jagi finds Shin and tells him that Kenshiro is weak, and if he truly loves Yuria, he should take her from Kenshiro. If he does not, she will surely die, as Kenshiro is not strong enough to protect her. 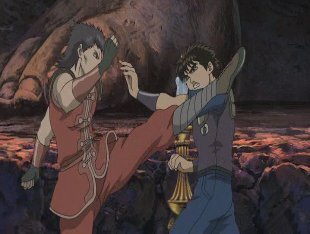 Shin takes Jagi's advice and confronts Kenshiro, defeating him with his Nanto Gokuto Ken (South Star Hell Slaughter Fist) technique. Yuria does not want to go with Shin, but cannot bear to see Kenshiro die. Shin gives Kenshiro seven scars on his chest in the shape of the big dipper before taking Yuria to his own city, Southern Cross. Despite his attempts, Shin cannot turn Yuria's heart, and she refuses to accept his gifts. Yuria knows that people will keep suffering for as long as Shin continues in his conquest, and she cannot let him do this any more. 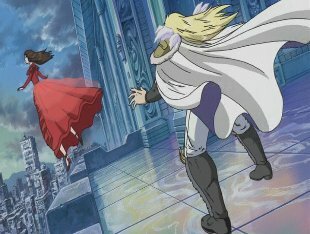 She jumps off of Shin's fortress before Shin can stop her. 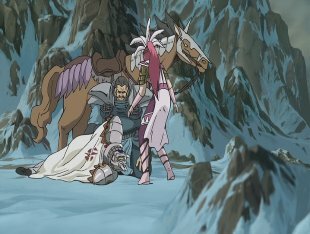 Shin runs down and outside, where he finds that Yuria is still alive -she was saved by the Nanto Goshasei (South Star Five Chariots). The leader of this group, Rihaku, says that they have come to take Yuria. Shin doesn't want to give her up, but then finds out that Raoh is heading to Southern Cross. 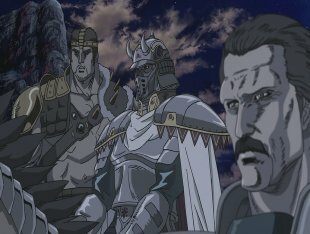 Raoh intends to invade Southern Cross, as he wants Yuria. 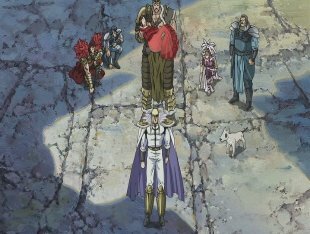 Rihaku says that if Raoh takes her, he will kill her without hesitation if she refuses to love him. 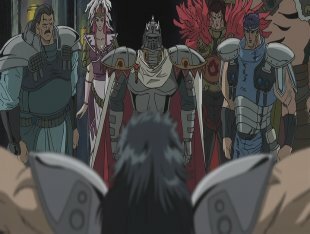 If his army and Shin's army fight each other, it will inevitably come to a clash between the two leaders. 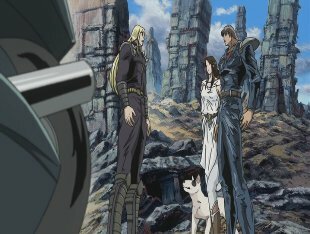 If Shin fights Raoh, will he be able to protect Yuria? Shin thinks about it and takes another look at Yuria. He touches her face, but as he does she weakly says "Ken". Shin makes up his mind and passes Yuria over to Fudo. 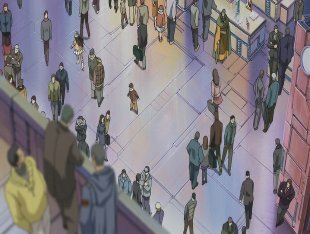 He tells them all to leave his city quickly as if people think Yuria is dead, Raoh will no longer try to pursue her. He knows that people will blame him for her "death", but it doesn't matter. 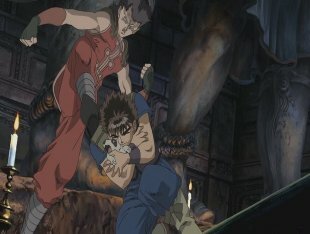 Kenshiro will soon arrive in Southern Cross to settle things with him, so until that day they need to keep Yuria alive. He then heads back into his palace alone. 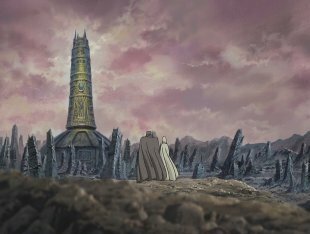 Yuria is taken to a place known as the Nanto Capital. There, she meets Dama again, who reveals he is sick. Dama says that Yuria is now the last Nanto General. When Nanto is in disarray, Hokuto appears. It is her duty to ally with Hokuto. Dama says that the promise he made all of those years a go has now been for filled. 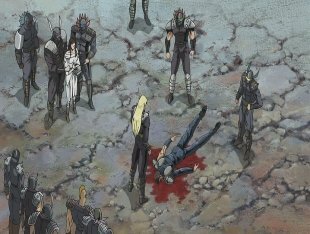 However Dama is sick and those are his last words to Yuria, as he suddenly coughs up a lot of blood and then dies in her arms. Yuria tells him that from now on, she will wear his armor as the last Nanto General. A year passes, and one day Yuria and the Nanto Goshasei happen to see Rei, a master of Nanto Suicho Ken (South Star Waterfowl Fist) killing some bandits. Yuria has Shuren, Hyuui and Fudo capture Rei and bring him to the capital. Rei sees the general and asks what she wants with him. She asks why he is searching for a man with seven scars and he says that this man kidnapped his sister the day before she was going to get married, and murdered her boyfriend. Rei is searching for this man so he can kill him, he only knows that he has seven scars on his chest. Yuria says that Rei's eyes are full of sadness and tells him to look for someone called Kenshiro. As Rei leaves, Rihaku asks Yuria if it was wise to tell Rei Kenshiro's name, as he might fight and even kill him. Yuria says that he won't, he will instead become his friend, as she has foreseen this. 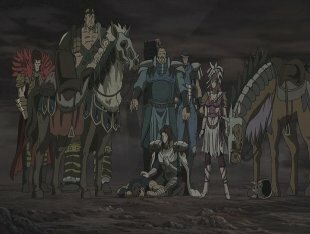 Later on Yuria, Rihaku and Tou talk about Raoh and Souther, when Yuria suddenly falls off her horse. Rihaku takes Yuria to Toki's village. Toki heals her, seemingly not knowing who it is beneath the armor. Toki asks the General why she wears a mask. Yuria says that until peace is returned to the world, she would rather stay like this. Toki tells her he'd expect no less from the person who Rei had met. He explains to her that he met Rei and that he gave him something to give to her, if he should ever meet her. He reveals some strands of Rei's hair and Yuria notices that it is white. 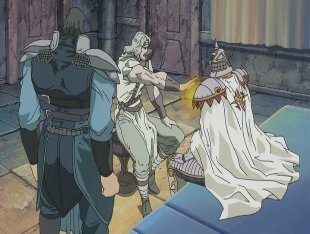 Toki explains that Rei is dead -he was critically injured by Raoh and given three days to live, but Toki managed to extend his life by hitting a pressure point on him, which turned his hair white in the process. 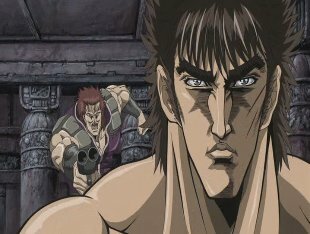 He told Toki that it was thanks to the last General that he met Kenshiro. After his sister had been taken away, he began to hate everything. But after meeting Kenshiro, he began to change back to how he used to be, and stopped being a bloodthirsty wolf. He became human once more. 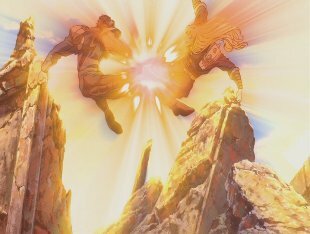 Yuria returns to the capital, but not longer after this Shuren and Hyuui then appear and have some terrible news: Souther has defeated Kenshiro! 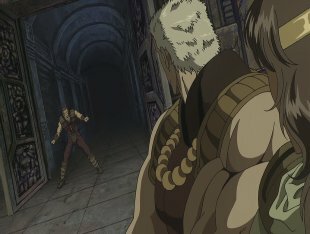 Yuria and the Nanto Goshasei head out, and find the injured Kenshiro out in the wastelands, after Shiba sacrificed himself to protect him. Yuria is about to heal him when she stops, as she can sense Raoh heading this way. 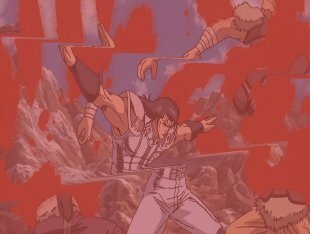 Some time later, Kenshiro defeats Souther with the Hokuto Ujou Moushou Ha (North Star Humane Fierce Flying Rip). 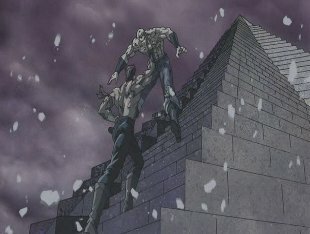 As Kenshiro reaches the bottom of the pyramid, Tobi runs to him. Ken recognises the dog and notices the necklace he is wearing, which breaks off. Ken catches it and sees that it has the big dipper on it. Everyone then sees that there is another army on a cliff nearby. There is then what I'd say is the single stupidest scene in all of the Hokuto no Ken series up to this point. 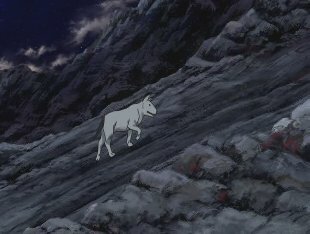 So after Tobi loses his necklace, he runs back off and heads up a hill, but it is clear that he is tired. His age is finally getting to him. But before he can die, Yuria decides that she has realised that Tobi was also a star: the star of fidelity. Tobi was the one who managed to bring Yuria and Kenshiro. Yuria says that she and Tobi have also always been linked by the heavens. 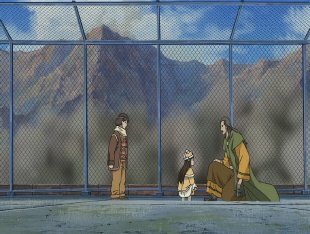 This scene is taken so seriously it is laughable and Rihaku even calls Tobi "Dog of Destiny" at one point. Stupid. Stuuuuuupid. You don't even get to see Tobi keel over either, he just stumbles out of shot, never to be seen again. After that pointless scene, Rihaku asks Yuria about the upcoming battle between Kenshiro and Raoh. She says that she knows that battle will happen soon, but even she cannot see who the winner of it is. But it is her destiny to find out. -A manga called Hokuto no Ken Yuria Gaiden - Jibo no Hoshi (Fist of the North Star Yuria Side-Story: The Merciful Mother Star) was released between 2006 and 2007, created by Ayumi Kasai. However, Ayumi's manga has nothing to do with the film, as she made a new story which takes place mostly before the nuclear war. 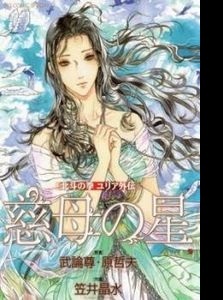 The manga shows how Shin met Yuria for the first time, and how he became the successor to Nanto Koshu Ken. Juuza of the Clouds also features in this manga. 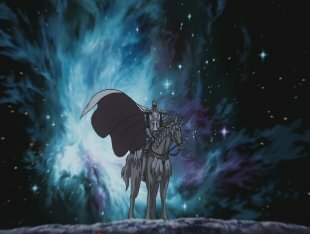 -Rather than create new animation, some footage in this movie was taken from Legend of Raoh: Chapter of Death in Love. -Shin's kick move is called Nanto Gokuto Ken in this film, as it was in the original manga. 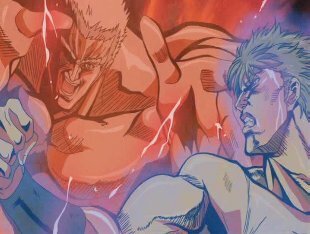 In the anime and 1986 movie, it was called Nanto Gokusatsu Ken (South Star Hell Murder Fist), because the original name offended Burakumin. I guess by 2007 they stopped caring. -This movie marks the first time Shin's fighting style is named. In the original anime, he would always refer to it as just "Nanto Seiken", but here he finally reveals his style's name to be Nanto Koshu Ken (South Star Lone Eagle Fist). -Fudo's voice actor, Daisuke Gōri, previously voiced characters in the original anime series, including Uighur and Akashachi.